No one has to tolerate living with a mole these days, especially since safe, modern methods are now available for their effective elimination. By investing in the simple outpatient procedure known as cryotherapy mole removal, unsightly and prominent skin discolorations can be banished forever, in the safety and comfort of your physician’s office or patient room. This is a very safe procedure which can achieve very satisfactory results by removing a source of embarrassment, and providing a tremendous boost to a person’s self-image and self-confidence. Who will develop skin tags? How is cryotherapy mole removal done? Using liquid nitrogen to freeze any unwanted skin lesions, moles, warts, or skin tags, they can be easily removed in just a few minutes, through this straightforward procedure. Any after effects are generally limited to minor swelling, or a slight difference in coloration compared to the surrounding skin cells, and even this will generally fade away. Not all physicians deal with cryotherapy for moles, so it may be necessary for you to seek a qualified cosmetic surgeon or licensed dermatologist to perform the procedure for you. This is a fairly important step, since success of the outcome is directly attributable to your doctor’s level of skill and experience. You should arrange for your chosen professional to conduct an examination of the mole in question to be sure it is not cancerous, and that it can safely be removed via cryotherapy. Skin tags are another candidate for cryotherapy removal, because they are small folds of skin which look similar to warts, but have no bodily function at all. The skin tag is connected to the body via a stalk, which supplies nutrition to it. People who develop skin tags or are more at risk for developing them are overweight people, possibly because of the friction which occurs between skin surfaces rubbing against each other. There is also a high incidence of skin tags among diabetics, although diabetes is not considered an actual cause of skin tags. 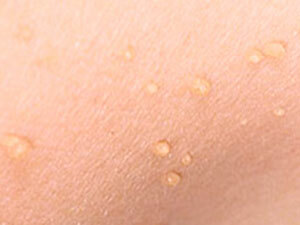 By a certain age, most people will have one or two skin tags on various parts of their bodies. Since cryotherapy mole removal relies upon freezing the mole for elimination, you can expect to feel at least a slight discomfort, due to the extreme cold temperature of whatever substance is used, usually liquid nitrogen, a.k.a. dry ice. The freezing agent must be applied directly to the skin at the site of the mole, so there’s no getting around the fact that a localized area will be subjected to extreme cold. It will feel much the same as holding an ice cube against your skin for a short period, only a bit colder. After the procedure, there is likely to be some minor swelling around the affected area, and the spot where the mole used to be is often slightly darker or lighter than the surrounding skin. However, within a couple weeks swelling has subsided, and in most cases the actual site of the procedure has blended in with the rest of your skin. First of all, your doctor should examine the mole to make sure it’s a good candidate for cryotherapy. That means it should not be too big a mole, and it should not penetrate below the skin line to internal layers. Assuming your mole is of the variety suitable for cryotherapy, the entire procedure can be done in your doctor’s office very quickly. 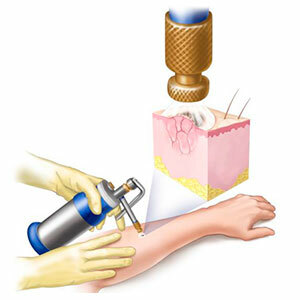 A spray applicator or a cotton swab will be used to accomplish the dry ice mole removal where the mole is situated. As freezing begins to affect the mole, it will change color to white and the skin cells of the mole will die, causing the mole to fall off all by itself. In the immediate aftermath, there may be some minor redness or swelling around the area. Skin tag removal freezing is a very safe procedure, with no more than temporary discomfort during the process, and probably some redness and swelling afterward. As with mole removal, cryotherapy for skin tags may or may not be available from your primary care physician, so it may be necessary to find a specialist who provides the service. Most often, liquid nitrogen or another freezing agent will be applied directly to the skin tag by a cotton swab in your doctor’s office. It only takes between 10 and 30 seconds for the freezing agent to kill the skin tag, but the process must be done very carefully, because liquid nitrogen will kill all living tissue it comes in contact with. As described above, mole removal freeze is done in almost exactly the same manner, with your doctor applying the freezing agent directly on the mole for 30 seconds or less in a very precise application. With all living tissue in the mole being killed by the liquid nitrogen, the mole will either fall away on its own, or can be easily removed by your doctor. 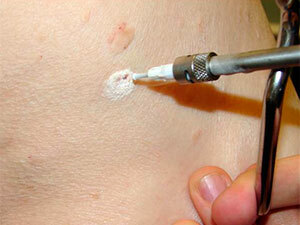 The cost for removal of a mole is generally linked to its size, location on the body, and its shape. A mole which is entirely on the surface, or at least mostly on the surface is less expensive to remove, because it can all be done in a single session, whereas anything below the skin surface may require multiple incisions and multiple sessions. It is also typical of moles on highly visible sites like the face or neck to cost more than for areas generally obscured by clothing, since high-profile moles must be managed with extreme delicacy and care. Larger moles are also more expensive because they require more freezing and possibly more incisions as well. The cost of removing a single mole is likely to be upwards of $500, but it can cost considerably more if any of the complicating factors just mentioned are present. It should be borne in mind that such cosmetic surgeries are not generally covered by health insurance, so cryotherapy mole removal will more than likely be an out-of-pocket expense for the person seeking relief. However, for a person of means, the cost is well within reason for the benefits it brings to one’s appearance, self-confidence, and sense of well-being. Moles situated away from the face can be removed inexpensively. Anyone who seeks out online reviews of patient experiences with cryotherapy mole removal will probably find the whole spectrum of reactions, from extreme happiness to occasional dissatisfaction, but it should be remembered that ultimate success or disappointment depends largely upon the professional who undertakes the procedure on your behalf. In some cases, patient reaction to mole removal is one of relief, especially from those who were concerned about their moles being malignant, and were thrilled to discover it was not (most moles are entirely benign), and could safely be eliminated. Having the procedure performed took away the sense of dread which had been growing within them, and feel as though they’d gotten a new lease on life. Probably some of the strongest reactions come from those people who have moles removed from an area on their body which others can readily see, because these are the ones which cause the greatest amount of self-consciousness and embarrassment. Quite often, these persons have had to deal with the unsightly moles since childhood or the early teens, and as a result they suffered from a loss of self-confidence which only removal of the mole could restore. By far, the most common reaction of people who have undergone the cryotherapy mole removal process is one of satisfaction with the results, and a sense of renewed confidence. This method is the least invasive of the possibilities for elimination of unwanted moles, and the cost is almost insignificant, compared to the benefits it provides. Removing a highly visible mole can have a transforming effect. Mole removal via a cryotherapy procedure is one of the safest, least invasive ways of having moles, warts, and skin lesions effectively eliminated. While the cost for this procedure may be one of the most expensive ways of accomplishing the removal, it remains as the quickest, most comfortable, and most effective methods for mole removal. 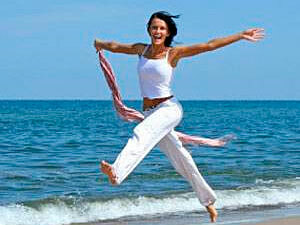 The benefits derived from having the procedure done are incalculable in terms of restored self-confidence and improved attitude. The key to having a successful procedure is primarily contingent upon finding just the right practitioner to do it, since not all physicians are experienced with cryotherapy methods. Very often, a trusted friend’s recommendation can be the best reference available for finding the right doctor, and it can steer you to someone who has consistently achieved great success, with unblemished client satisfaction. It often happens in life that there are few, if any, avenues available to people who desperately wish to change their appearance for the better – cryotherapy mole removal is one of those almost miraculous possibilities which allow you to do just that.